Vladimir Putin is the current president of Russia and is on his fourth term in the position. Putin has gained recent national attention due to his controversial relationship with President Trump, and the human rights violations against the LGBT community in Russia. Putin’s political career began early in the 1990’s, and his popularity has continued to grow. As of 2019, Vladimir Putin’s net worth is estimated to be $70 Billion. Vladimir Vladimirovich Putin was born on the 7th October 1952 in Leningrad, Russia, and is the youngest of three in the family. His two brothers died before he was born; one in infancy, and the other of diphtheria. His mother was a factory worker, and his father was injured in the war. Putin was interested in the Soviet cinema and wanted to portray the intelligence officers, that were often in those movies. He took up sambo and judo and became a black belt in Judo. Vladimir also studied German in high school and is now able to speak it fluently. After high school, Putin studied Law at the Leningrad State University, from which he graduated in 1975. Following law school, Putin joined the KGB and worked in counter-intelligence, and then served undercover in Germany until 1990. He resigned from the KGB with the rank of Lieutenant Colonel in 1991. Putin’s political career began in 1990 when he was appointed as an advisor of international affairs to the Mayor of Leningrad. Putin moved through various roles in the government, including a stint as deputy chief of Presidential Staff. In 1999 Putin was appointed acting Prime Minister of the Government of the Russian Federation, and Putin agreed to run for the presidency. He was not officially affiliated with any political party but pledged support to the Union party. A few months after becoming acting Prime Minister, he became acting President of the Russian Federation. His first presidential term ran until 2004, and his second term ran until 2008. During his second term, the National Priority Projects began as an effort to improve Russia’s health care, education, housing, and agriculture. 2008 saw the second premiership for Putin, as he was not allowed to run for a third term due to the Constitution. However, in 2012 he was appointed President for a third term and is currently in his fourth term. Russia has seen several changes in Putin’s time in control; such as a reorganization of the electoral districts, the annexation of Crimea, and a military reform. As of 2019, Vladimir Putin’s net worth is $70 billion. Vladimir Putin has been serving his country in multiple ways since his graduation from law school, beginning with service in the KGB. He is currently on his fourth term as President and has implemented several significant changes to the country. Vladimir Putin’s net worth is over $70 billion and is reflective of his lengthy political career. 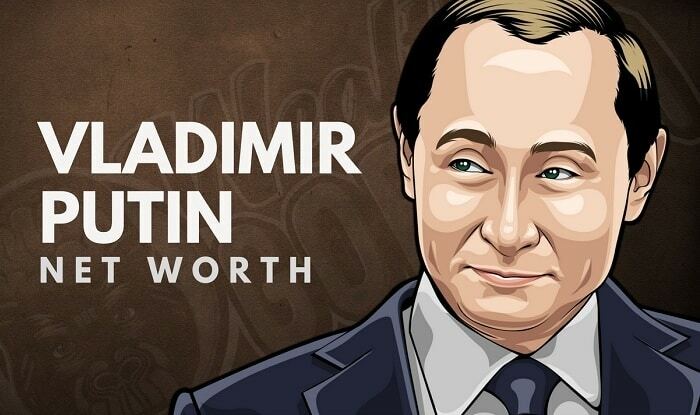 What do you think about Vladimir Putin’s net worth? Leave a comment below.